The lead up to Christmas has seen staff at the UK’s leading garage door manufacturer, Garador, collect food parcels to donate to their local food bank. 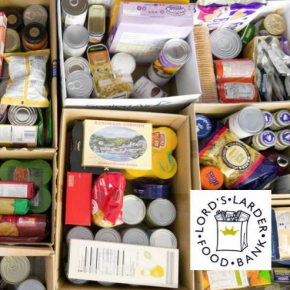 The Lord’s Larder, based in Yeovil, provides emergency food supplies to local families, and has been doing so since 1991. Garador staff have been donating food to their local food bank for the last couple of years, and this year they donated even more, with over 100 food items given, with a tremendous variety of items, including biscuits, pasta, tinned vegetables, tinned fish and even a Christmas pudding! This year, Garador’s very own Alanna Babiy organised the food collection and worked extremely hard to make it a success. Garador’s MD, Neil Discombe commented: “We donated food to The Lord’s Larder last year in the run up to Christmas and this was something I was really keen to repeat again this year, to support those in need in the local community. Södra is preparing for any potential Brexit outcome by increasing its stock by roughly 20% to ensure customers have enough stock to cover any potential delays.